Hundreds of millions of people have already died, and millions more will soon fall-victims of disease, hunger, and dehydration. It is a time of drought and war. The rivers have dried up, the polar caps have melted, and drinkable water is now in the hands of the powerful few. There are fines for wasting it and prison sentences for exceeding the quotas. And then he was gone. Vanished in the middle of the night. Was he kidnapped? Did he flee? Is he alive or dead? There are no clues, only questions. And no one can guess the lengths to which they will go to keep him silent. We have to find him-and the truth-before it is too late for all of us. First I have to mention how gorgeous this cover is!! It’s what caught my eye and made me want to learn more about this book. When I saw that it was a dystopian, I was even more excited. I really liked the idea of this book: a future where water is more precious than gold. I think it’s a very original idea. I’ve read a lot of dystopian fiction and many of them have elements that you start to notice repeated in each book. This was an idea that I hadn’t heard before. The two main characters are siblings Vera and Will, though the book is told solely from Vera’s point of view. Vera and Will live with their mother, who is ill, and their father, in a district struggling for water just like everywhere else. One day while waiting for the school bus, Vera sees a boy standing in the middle of the road drinking a cup of water and dumping what’s left on the ground. Vera can’t believe what she’s seeing. You don’t just waste water like that; in fact it’s illegal. When she calls him out on it, Kia looks at her blankly and says that there is plenty of water. Kia and his defiance instantly intrigue Vera. After this chance encounter, Kia becomes an everyday part of Vera’s life, waiting for her at the bus stop, going to her house for dinner. Then one day he’s gone. Vera and Will are determined to rescue him. They set off early in the morning and hope to be home for dinner (how niave). Their search ends up leading them far from home and into the hands of some very dangerous people. I felt like the author was trying to cram in too much action and too many points of interest. Disappointingly, this left him with no climax. Each problem arises quickly and is resolved so fast that it just became unrealistic and boring. By the end, I was like oh geez, they’re two seconds away from death – again. I’m not going to sweat it though because I know everything is going to be hunky dory by the next page. Although this book isn’t going to be taking over residence as my new dystopian favorite it wasn’t all bad, and overall I’m still glad I gave it a try. 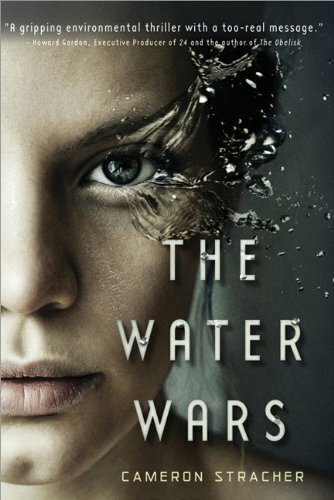 This entry was posted in 3 Hearts, Dystopian, Middle Grade and tagged Cameron Stracher, Sourcebooks Fire, The Water Wars. Bookmark the permalink. I've also been drawn to this cover! thanks for the review.